British Columbia has over 20 Prostate Cancer Support Groups meet once a month. This group is focused on providing help to Chinese-speaking men, but everyone is welcome. We speak Mandarin, Cantonese and English. We meet on the second Thursday of every month from 7:00pm to 9:00pm at the Richmond Public Library (2/F Brighouse Main Branch, 7700 Minoru Gate, Richmond, BC V6Y 1R8). Please register online at The Richmond Public Library website (or call 604-231-6413 for registration). Join us for the professional presentation and talk to other men and family members who have been dealing with prostate cancer for weeks, months or even years. If you want to chat with a survivor one on one, you may drop in our walking club. The Richmond Blue Walkers walk on every Tuesdays and Thursdays 9-11am, 5-10 km along the beautiful river dykes and parks in Richmond (Walk in the Richmond Shopping Centre during the raining days or cold seasons). Click here for the schedule or contact Daniel Leung at 604-836-6423 for the locations and meeting places. 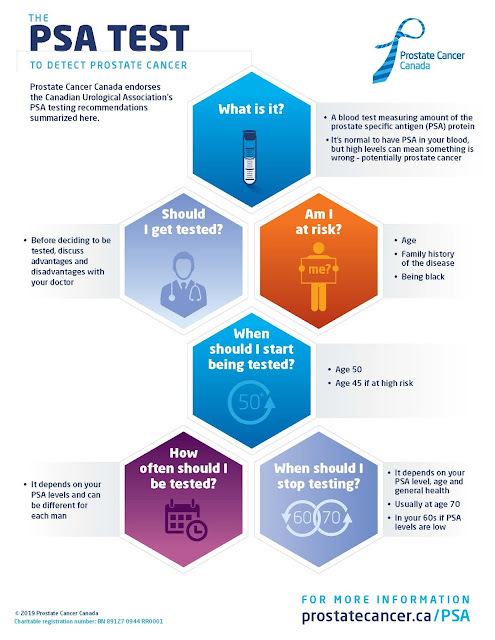 The PSA test is a key step in early diagnosis. It is important for to discuss the test and your personal risk factors with your doctor to make an informed decision about whether the PSA test is right for you. Prostate Cancer Canada endorses the Canadian Urological Association’s (CUA) recommendations on prostate cancer screening and early diagnosis. What is my risk of developing prostate cancer? Be sure to understand your own risk: Are you a black man? Do you have a family history of prostate cancer? Your risk also increases as you get older. Be sure to discuss this with your doctor. What are the advantages and disadvantages of being tested for prostate cancer? How can I reduce the risks? Should I have a PSA test and a DRE? What happens if my PSA levels are high? Do I have another PSA test or go for other tests? What happens if my PSA levels are normal? When should I get tested again? What is the PSA test? What are the advantages and disadvantages of the PSA test? What happens if my PSA value is high? Do I have to pay for the PSA test? Is the PSA test the same as the digital rectal exam (DRE)? What is shared decision making? My doctor doesn’t believe I should get a PSA test, but I do. What should I do? What else is PCC doing to improve diagnosis and make sure prostate cancer is detected early? Contact Prostate Cancer Information Service to talk to an information specialist. Find a support group near you. How should I prepare for PSA test? What affect the result? The Pros and Cons of PSA testing for prostate cancer? Should I have a prostate biopsy? Just diagnosed? Where to get help? Just diagnosed? Choose a treatment? Get help from peers? Become a navigator? How to support my family member or friend as they face prostate cancer? Immunotherapy: The Silver Bullet Against Cancer? If I Were Tom - Tom is dealing with prostate cancer. The waiting. The treatments. The side effects.